Today it was time to give my new grey workhorse suit a second wear. I really love the fit on this one. The spalla camicia shoulders follow a soft and natural line and it has the perfect setup of two horizontal front pockets and a chest pocket (I hate angled front pockets and ticket pockets). Also, the fit along my body was just spot on from the start saving me some green ones with the alterations. However, the best thing ever is the fabric. The suit has been made from Loro Piana’s Super 150 Tasmanian Wool, and it is just insanely soft and light to wear. Had the piece been made by some bigger brand than Cavaliere I don’t dare to even think how much it would have cost. Now for 40% off the price was very reasonable for the quality. I decided to use it today with a light blue spread collar shirt, yellow grenadine tie from Ede & Ravenscroft and brown leather. 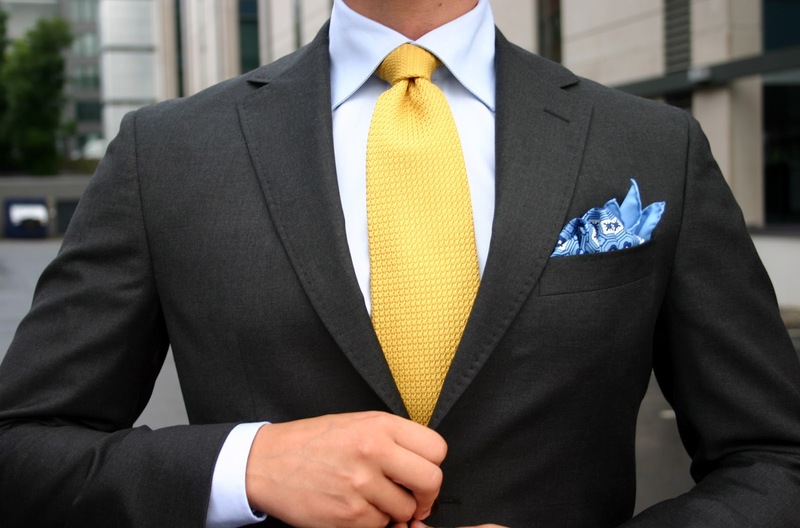 Furthermore, I decided on a blue pocket square to keep the fantastic tie as a center piece. The shoes are my C&J Hallams and the belt from Equus Leather. 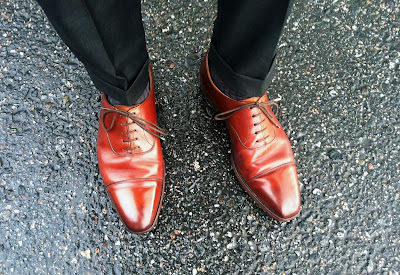 I did think of picking my rather sleek Cheaney loafers instead, but it just didn’t happen. Should there be one more a bit warmer day, I will probably use this with them and a more casual tie. Where can I buy this suit? Looks really good despite of the highish buttoning point. 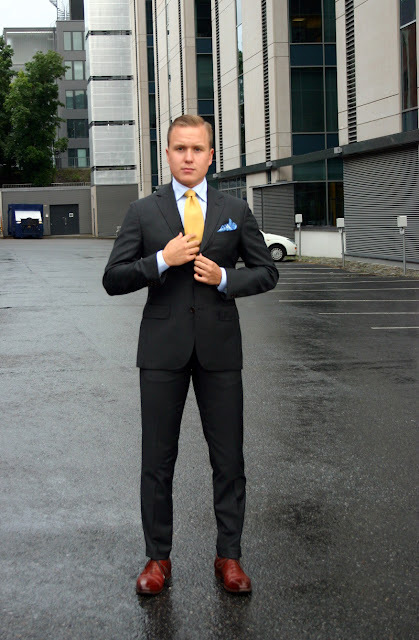 This is definitely a good basic grey suit, and I got mine from Sauma in Helsinki. They let me size down one with the jacket to get the shoulders right, which also affected how it sits on me. The buttoning point is about 1-1.5cm higher than the 'average' and the length perhaps 2cm from covering my whole rear. Like I wrote above, this is from Sauma in Helsinki. I started thinking what the discount was exactly, and I think it was 30% after all. Furthermore, they had two different kinds of grey Cavalieres, this one being more expensive. The cheaper one was more structured and lacked the nice soft lines and especially the shoulder construction this one has. I wish it was MTM, but still as a student as my main occupation I'm afraid not yet in a few years. Hopefully that helped. Have a nice week and thank you for your interest! Not trying to hate, but I think the Suit does not fit you well. The buttoning stance isn't doing your physique any favor, so does the short jacket. Also, there is some serious lapel bowing going on, indicating that the chest is too tight for you. The pants are really to tight, even when you are standing the pockets are visible. Can you sit down in those pants? I have been following your blog for quite a while now, and it strucks me everytime. I would suppose you stop buying stuff and first learn abit about fit. This will really save you "some green ones". Again: I am not trying to hate or something, just want to be helpful. I value your feedback. The tad high buttoning stance is a personal preference along with the jacket length (I have to say I don't think this jacket is THAT short though), and I know that some people won't agree with it. That's really all I can say to that. However, you're totally right about this being a bit tight on the upper torso and my upper legs. I will probbaly let out both a bit, but I prefer to wear stuff for a few times before I make any final alterations (especially when there's a lot of sports planned for the near future). I personally think this way you get the feel of what needs to be changed better leading to a more satisfying result. Here the legs will need more room (especially with the workout coming up), but I need a bit more wear with the jacket before I'll decide what to do. Anyway, thanks for your comments, it's appreciated. I don't think it's that high actually, the picture is from an upward angle and my hands are in the way. Anyway, I think the jacket itself is well in balance now, and a lower buttoning point would ruin it. I personally prefer classic suits, but with a strong shape. Hey NF, don't take any notice of Mr Negative. The suit is a perfect fit on you, the pockets are visible slightly on the trouser but this emphasises a good strong upper leg - nothing to be ashamed of and possibly not one of the features of Mr N. The fabric will loosen as it wears. Nice to hear your opinion. 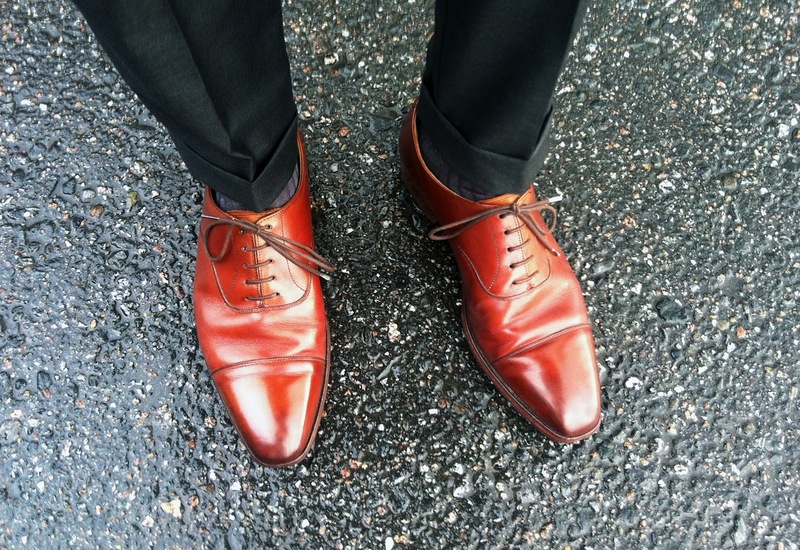 I'm quite used to get some comments on my preferred fit, especially from the more conservative persons in the US. I agree with you though, and like I mentioned before, some use will always help you assess the piece better as well as let it mold on you a bit. In this case I think the ultra thin wool also has a lot to do with the pockets showing, along with my stance in this picture.